The Joy of Cooking grows with the times--it has a full roster of American and foreign dishes such as strudel, zabaglione, rijsttafel, and couscous, among many others. In this updated version, all the classic terms you'll find on menus, such as Provenale, bonne femme, meunire, and Florentine are not merely defined but fully explained so that you can easily concoct the dish in your own home. The whys and the wherefores of the directions are given throughout the book, helping you create recipes you never thought possible. A special emphasis on a vital cooking factor--heat--is added in this new edition. Your best-laid plans can be either made or marred simply by the temperature of a single ingredient. Learn exactly what the results of simmering, blanching, roasting, and braising have on your efforts. An enlarged discussion on herbs, spices, and seasonings tells you the suitable amount necessary in recipes. With more than 1,000 practical, delightful drawings by Ginnie Hoffman and Ikki Matsumoto, you can learn how to present food correctly and charmingly--from the simplest to the most formal service, how to prepare ingredients with classic tools and techniques, and how to safely preserve the results of your canning and freezing. No necessary detail to your success in cooking has been omitted. 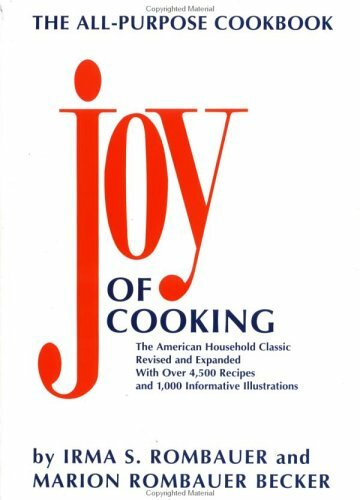 Divided into three parts, Foods We Eat, Foods We Heat, and Foods We Keep, The Joy of Cooking contains more than 4,500 recipes with hundreds of them new to this edition. This American household classic is the most essential item for your kitchen.